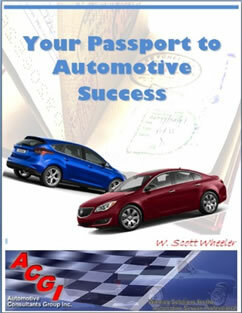 Your Passport to Automotive Success | Automotive Consultants Group, Inc. This book/course is designed to engage the automotive service and repair professional to understand the underlying motivations and drivers the “Why” proceeding into the “What”. Beginning with personal and professional goals, then an understanding of the basic numbers used to track progress in our industry. Business plans and models, coupled with an overview of marketing strategies, will educate the student as to how to hit their respective targets. Systems and processes are reviewed as supporting activities for the business plan. No plan is complete without the structure, education and training, coupled with solid leadership, flexibility, and of course, building a productive and engaged team. 8 hours or 4 hours. Can be customized to fit particular time slots.